It is not expected that the planning board will make any decisions on the 10th. 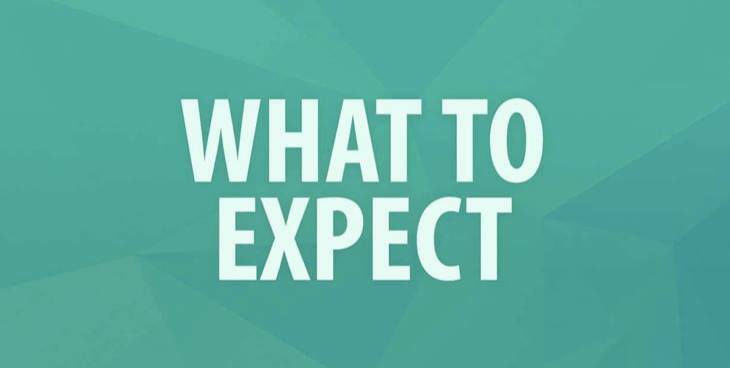 A regular planning board meeting will occur on Monday, 4/15 where the planning board may decide on the items listed in the 4/10 AGENDA (lot line deletion, site plan / special permit and SEQR determination (pos or neg dec)). #9-17 & 21 North Front Street and 51 Schwenk Drive and a portion of Fair Street Extension LOT LINE DELETION of the Lands of Herzog’s Supply Company and the City of Kingston. SBL 48.80-1-25, 26 & 24.120. SEQR Determination. Zone C-2, Mixed Use Overlay District, Stockade Historic District. Kingstonian Development, LLC/ applicant; Herzog’s Supply Co. Inc. & City of Kingston/owner. #9-17 & 21 North Front Street and 51 Schwenk Drive and a portion of Fair Street Extension SITE PLAN/SPECIAL PERMIT to construct a Mixed Use building with a 420 car garage, 129 apartments, 32 hotel rooms, and 8000sf of retail space. SBL 48.80-1-25, 26 & 24.120. SEQR Determination. Zone C-2, Mixed Use Overlay District, Stockade Historic District. 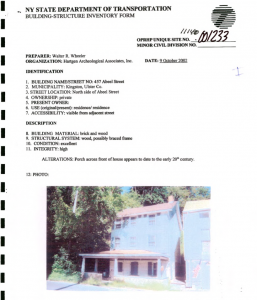 Kingstonian Development, LLC/ applicant; Herzog’s Supply Co. Inc. & City of Kingston/owner. The Significance of State Environmental Quality Review (SEQR) Determinations. What step are we at in the process? On April 10th, the City of Kingston Planning Board will collect public comment on its next step in making a “determination of significance.” This is the most critical step in the SEQR process. This is the step in which the lead agency must decide whether or not a proposed action is likely to have a significant adverse impact upon the environment. If the lead agency finds one or more significant adverse environmental impacts, it must prepare a positive declaration identifying the significant adverse impact(s) and requiring the preparation of an Environmental Impact Statement (EIS). At this time, environmental impacts must be cited before the social or economic concerns are included in an Environmental Impact “Scope” (p. 93, SEQR Handbook), and a pos dec would be required in order for a public scoping process to occur. The project would seem to be justifiably determined as a pos dec, as only one potential adverse environmental impact is required in order for a pos dec to be triggered (p. 85, #5). Uptown Kingston’s significance as a National Historic District is a reason for a pos dec. Traffic (the traffic for this project appears to be over the threshold for peak hour outlined in the law) would be a trigger. Visual and Aesthetic and Neighborhood Character are all legitimate environmental impacts (p. 90 of the SEQR Handbook). 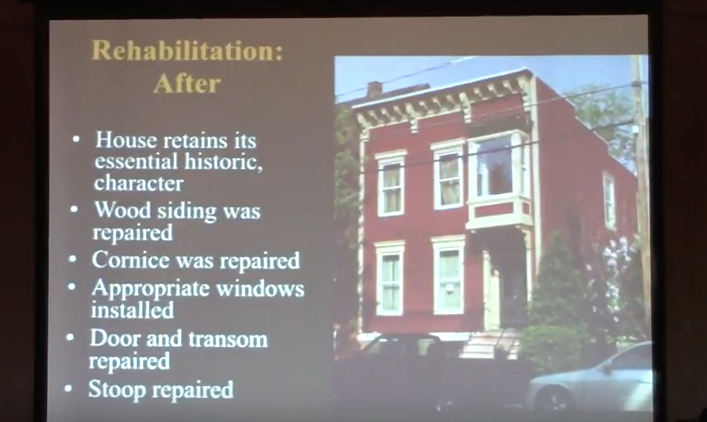 As the Historic Landmarks Preservation Commissions (HLPC) has already weighed in as an “involved agency” to indicate the potential significant adverse environmental impact on the character of the Stockade National Historic District, the Planning Board, as the “lead agency” is obligated to take a “hard look” according to important case law precedents that have invalidated findings by lead agencies that have failed to do so. Historic Landmarks Preservation Commission (HLPC) Identifies Potential Significant Environmental Impacts of the Kingstonian Project. 1. Where is the planning board currently in the SEQR determination process? 2. When will the planning board make that determination? 3. Is the project being modified and will it be modified by the applicant and developer to try to address or mitigate potential impacts? 4. Will the public be notified of those modifications and have an additional opportunity to comment on the modified project before the Board makes a SEQR determination? Below are excerpts from the SEQR Handbook to help you to identify good information to shape your public comment for Wednesday evening. 23. Are there impacts on non-physical resources that should be considered when determining significance? Yes. There may be environmental impacts related to various community or regional values not necessarily associated with physical resources. Examples would include aesthetic impacts, impairment of community character, growth inducement and social and economic conditions, which are discussed below. 24. Why should the significance of visual and aesthetic impacts be considered under SEQR?The courts have upheld inclusion of effects on scenic views as an element of the SEQR review process; for example, in the case of a new radio transmission tower proposed to be constructed near the F.D. Roosevelt estate on the Hudson River (see WEOKBroadcasting Corp. V. Planning Board of Town of Lloyd 1992). 25. What methods or resources may a lead agency use in assessing potential visual and aesthetic impacts? Because the quality of an aesthetic resource cannot be determined by a precise formula and because opinions may vary concerning the evaluation of visual impacts, there exists a widespread, but erroneous, notion that aesthetics analysis is hopelessly subjective. Instead, research has clearly established that landscape preference and perception are not arbitrary or random, so that along with some variability there is substantial regularity in the perceptions of significant adverse and beneficial visual impacts. It is upon this regularity of human judgement concerning aesthetics that objective decision making depends. Developing an objective process for considering visual impacts is most effective if undertaken before controversial projects appear. To establish or clarify values, policies and priorities related to existing visual resources, agencies or municipalities should conduct an inventory of visual resources within their jurisdictions. Such surveys need not be elaborate, but are a recommended feature of any comprehensive planning process that the agencies or municipalities may undertake. The prime objective is to be proactive and identify visual resources that are significant within that jurisdiction and could be adversely affected by potential development. • Whether the value of the aesthetic resource has been established by designation; for example: state park, designated scenic vista, designated open space, etc. • The number of people who could observe the potential impacts. • The circumstances or contexts under which impacts would be visible. • The distance the viewer is from the aesthetic resource. When the responses to these and other pertinent questions about potential impacts to aesthetic resources are compiled, the lead agency will know, for example, whether the resource is designated as important, is viewed by thousands of people annually when they use the resource (e.g. park), or if the potential impact is adjacent to that resource. Based on this systematic assessment, the lead agency will then be able to consider visual and aesthetic impacts in developing its determination of significance. 26. Has the Department of Environmental Conservation (DEC) developed any additional resources for assessing aesthetic and visual impacts? The DEC guidance policy “Assessing and Mitigating Visual Impacts” was developed to provide direction to DEC staff for evaluating visual and aesthetic impacts generated from proposed facilities. The policy and guidance defines what visual and aesthetic impacts are; describes when a visual assessment is necessary; provides guidelines on how to review a visual impact assessment; differentiates State from local concerns; and defines avoidance, mitigation and offset measures that eliminate, reduce, or compensate for negative visual effects. The cornerstone of the DEC guidance document is its inventory of aesthetic resources of statewide or national significance. The scenic and aesthetic resources identified in the guidance have all been protected by law or regulation, and are therefore special places that the public has deemed worthy of protection due to the inherent aesthetic value associated with the resource. For example, one category is state and national parks which havebeen established by government to protect unique resources, and are accessible for use and appreciation by the public. The DEC guidance defines State regulatory concerns, and separates them from local concerns. However, the DEC guidance may be used as a model by other agencies or municipalities. Once local authorities have officially identified locally important visual resources, the guidance may be used to assist a lead agency in systematically evaluating potential visual and aesthetic impacts from a proposed development. 27. How do aesthetic and visual impacts differ from community character impacts? Visual impact assessment considers a single class of resource. While visual resources may contribute to a community’s perception of its character, a number of other resources should also be assessed or evaluated to enable a more thorough description of a community’s character. 28. Why is “community character an environmental issue? The Legislature has defined “environment” to include, among other things, “…existing patterns of population concentration, distribution or growth, and existing community or neighborhood character” (see ECL 8-0105.6). Court decisions have held that impacts upon community character must be considered in making determinations of significance even if there are no other impacts on the physical environment. 29. How can you determine whether an impact upon community character may be significant? Community character relates not only to the built and natural environments of a community, but also to how people function within, and perceive, that community. Evaluation of potential impacts upon community or neighborhood character is often difficult to define by quantitative measures. Courts have supported reliance upon a municipality’s comprehensive plan and zoning as expressions of the community’s desired future state or character. (See Village of Chestnut Ridge v. Town of Ramapo, 2007.) In addition, if other resource-focused plans such as Local Waterfront Revitalization Plans (LWRP), Greenway plans or Heritage Area plans have been adopted, those plans may further articulate desired future uses within the planning area. In the absence of a current, adopted comprehensive plan, a lead agency has little formal basis for determining whether a significant impact upon community character may occur. Examples of actions affecting community character that have been found to be significant include the introduction of luxury housing into a working-class ethnic community and construction of a prison in a rural community. • Examples of actions found not to be significant include low-income housing and shelters for the homeless proposed to be located within existing residential areas. This post was updated December 21, 2018, to clarify two details. Firstly, the assistant corporation counsel, who provides legal counsel to the city’s commissions and boards, insisted to the Commission that the transcript of the final hearing would be sufficient for explaining the rationale of the Commission’s decision in lieu of a thorough written decision. Secondly, frequent intrusions in the commission’s final deliberations were made by the applicant and their lawyer and not other members of the public. No single detail defines a historic district’s character. It is the multitude of details taken together that creates a distinctive environment and sense of place. Such character-defining qualities include the relationships of buildings to each other and to the street. Do the buildings form a continuous streetwall or are they spaced apart? Are they situated directly at the street or are they set back from it? What was the historical development trend that led to their existence? Is there a discernible rhythm or pattern of details, be it building sizes, roof massing, cornices, or windows? Many districts have multiple rhythms. Character is also defined by the type of buildings, their construction, and scale—the architecture of a single-family dwelling is different than that of a store-and-loft building in terms of massing, façade proportion, materiality, fenestration, and building features like porches and storefronts. The qualities described above are aesthetic ones. It is incumbent on members of the HLPC to consider all of them when considering the appropriateness of new construction in a historic district, be it an addition to an existing structure or a wholly new building on a vacant site. 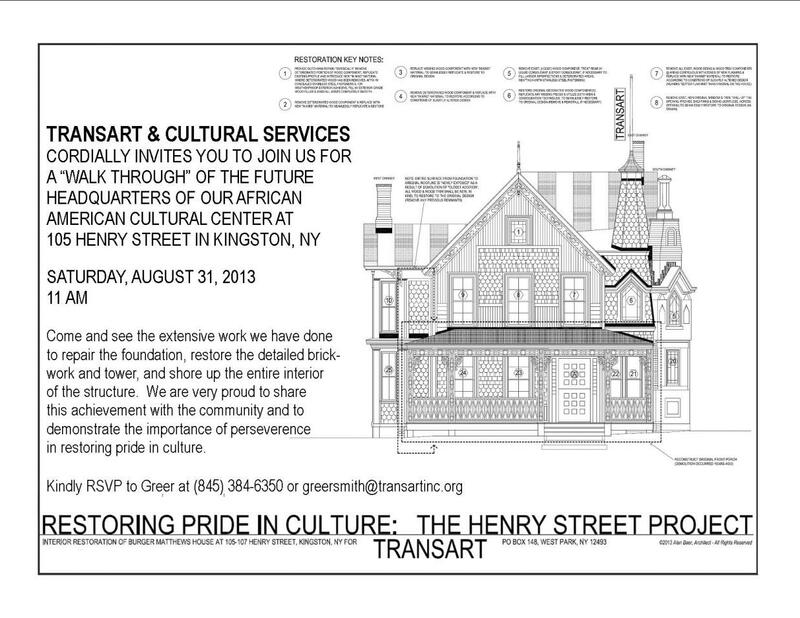 A Correct Path for a Complete and Proper Reset of Historic Preservation in Kingston (and just in time). 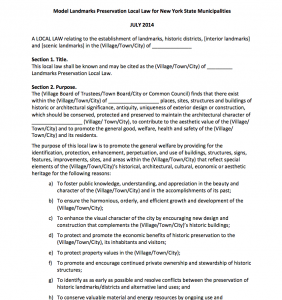 At last evening’s Kingston’s Historic Preservation Landmarks Commission (HLPC), the group introduced a draft of an updated preservation ordinance, modeled after the 2014 preservation ordinance, in accordance with the Certified Local Government guidelines (SHPO) and with preservation ordinances from Saratoga Springs, Syracuse, Buffalo, and Rochester. Kingston having the rich history that it does, and seemingly everyone’s support to preserve it, requires clear guidelines, policies and laws which we simply haven’t had in place for a long time. Additionally, and for decades, the City of Kingston’s HLPC has been siloed from everything else. Today, we are on a clear path for a complete and proper reset of what is old and fragmented preservation guidelines. We encourage everyone to view this 50-minute discussion. It’s illuminating and exciting to see a process like this being handled so professionally. You can follow along with the video (starting at 2:00) and the powerpoint presentation (click on image below for the entire PowerPoint) created by HLPC’s Vice Chair Marissa Marvelli. On September 19th, the Kingston Common Council’s Laws & Rules Committee may discuss whether or not to throw out or to table the Corporation Counsel office’s draft legislation to merge the Heritage Area and Historic Landmarks Preservation Commissions. It will be nearly the fourth consecutive meeting for which this matter has been a topic, and it’s our opinion that the Council should not hesitate to throw out the legislation and instead, continue on the promising path that they are on now. The council members who serve on the committee deserve praise for their careful study of the Corporation Counsel’s draft legislation and the reasons why it is being proposed. After a lot of information-gathering—particularly at their meeting in July where they heard directly from program administrators—it appears the broad consensus of the committee is that merging the commissions will not meaningfully address issues concerning the regulatory review process, and in fact, may create new problems. And what are the issues exactly? What problems is “streamlining” meant to solve? Were other solutions considered before the legislation was put forward? No one could say for sure. The reasons repeated by city administration is that merging the commissions is a recommendation of the now disbanded Comp Plan Re-zoning Subcommittee without sharing any notes that show how that conclusion was reached. At face value, the idea to eliminate one step in the public review process by combining two related volunteer commissions would seem like a rational change. Why make an applicant appear before two separate commissions for a new business sign? No one is arguing in favor of such redundancy, but is there another way to solve this? VIDEO: Kingston Laws and Rules Committee Host Roundtable to Clarify Kingston Development Processes. CITIZEN REQUEST. Please request that the Kingston Common Council Laws and Rules Committee throw out streamlining legislation and continue to collaborate with all relevant Kingston departments, boards and commissions to clarify the development process scenarios comprehensively in the City of Kingston. In April of this year, draft legislation to “streamline” the Historic Landmarks Preservation and Heritage Area Commissions was introduced by the City of Kingston’s executive branch to the common council with support from both the Planning and Building Departments. Streamlining Historic Commissions, they argued, would eliminate any redundancies and create a more efficient process for project sponsors who came forward with development concepts for the city. It’s been a rocky road since, with Kingston’s assistant Corporation Council misleading the council and the public by providing false time requirements and pending litigation that was never understood as reasons to get the streamlining legislation as a local law passed by September. To help to better understand the process, we jumped in to provide an important educational forum so that we had good information for debate. With more questions than answers, the majority of the council (7-2) with the public’s support, brought the proposed ‘streamlining’ legislation back to committee from the floor for further review. How did the City of Kingston’s Planning and Building Department come to the conclusion that streamlining commissions was the best way forward? 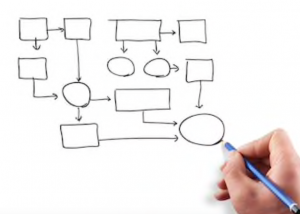 Was there a flowchart of all development processes? Had all parties involved been gathered to discuss the process to collectively agree that streamlining was the solution? We got our answer during July’s Common Council Laws and Rules Committee meeting. Led by Ward 9 Alderwoman Andrea Shaut, who serves as the liaison to the Laws and Rules Committee on the streamlining matter, a roundtable discussion was called that included invitations to all decision makers – whether regulatory or advisory. Turns out that this was the first time that everyone had been brought together to discuss. The planning department didn’t have flowcharts and Kingston’s Planning Director Suzanne Cahill insisted that the development process was not ‘one size fits all’ so it wasn’t possible to create them. Really? Even SEQR has a flowchart. When you are talking about processes that if not available, up-to-date or followed correctly will impact the public in profound ways, you better get that information out of your head and onto the page. 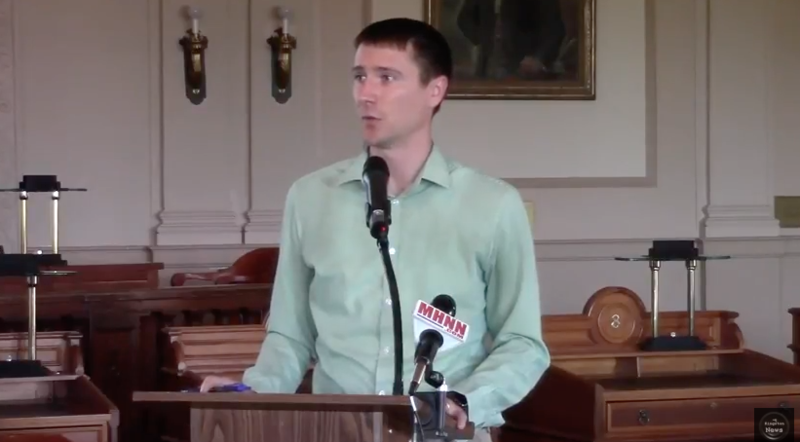 VIDEO: Kingston Common Council Sends Streamlining Historic Commissions and Legislation Back to Committee. Click on image to review the legislation packet from last night’s Council meeting. Scroll down to see Resolution #107 and accompanying legislation. In what might might very well be in my top 10 most perplexing processes I’ve witnessed in 12 years at KingstonCitizens.org, good sense prevailed and Resolution #107 of 2018 “Common Council of the City of Kingston Establishing a Public Hearing Regarding the Possible Merger of the Historic Landmarks Preservation Commission and the Heritage Area Commission” (with accompanying legislation from 5/16/18 to be sent out to Involved Agencies) was referred back to the Laws and Rules Committee for proper vetting with a 7 / 2 vote. The good news is that I think Kingston is venturing into a new kind of conversation to better understand Historic Preservation in Kingston with a secondary goal to identify best practices so to make the review process for development more efficient. Thanks to council members for a thoughtful and robust debate. It’s also a moment for the executive branch to contemplate better boundaries for its corporation counsel. I hope that the Kingston Common Council will also consider advocating for a budget line to provide its own council on retainer for second opinions. With a new budget cycle coming up, it’s the perfect time to be putting that forward. I think the public might readily support that this year given this flub. The council should have staff, too. What happened to the council clerk position that began last summer and ended in the fall? A refreshed value may be placed on the Historic Landmarks Preservation Commission (HLPC), with the council allocating a council liaison and/or, assigning the HLPC to a council committee (perhaps Laws and Rules) for an ongoing dialogue to allow relationships to be built and for council members to have the opportunity to get to know Historic Preservation items and issues in real time, as well as to come to a new appreciation of the work that our commission is doing on Kingston’s behalf. That seems entirely possible to me now. Below is video from the recent council caucus and meeting with excerpts. Thanks to my partner Clark Richters of the Kingston News for his great work in recording video for this, and all of the meetings that we cover. I couldn’t do it without him. The Proposed Legislation to Merge Kingston’s Historic Commissions is not Ready for a Public Hearing. 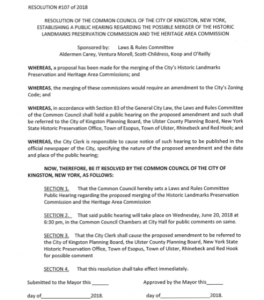 Please plan to attend the next Kingston Common Council meeting on Tuesday, June 5th at 7:30pm, where the council will vote on a resolution that would send the proposed legislation for a possible merger of Kingston’s historic commissions to involved agencies for comment that include the Ulster County Planning Department, Kingston Planning Board, Town of Ulster, NYS SHPO, Town of Esopus, Rhinebeck and Red Hook. Request that Kingston’s Common Council deny the resolution and instead, send the proposed legislation back to the Laws and Rules committee for further study and development with members of the Heritage Area Commission, Historic Landmarks Preservation Commission and Kingston Common Council members. The current legislation to merge the Historic Landmarks Preservation Commission (HLPC) and the Heritage Area Commission (HAC) is not ready for public comment. Recently, legislation appeared at the Kingston Common Council’s Laws and Rules Committee brought forward by Kingston’s Corporation Council to “streamline” or merge Kingston’s HAC and HLPC commissions. This month, and only two days after KingstonCitizens.org hosted a well attended educational forum on ‘Rethinking Historic Preservation” in the city of Kingston, the controversial legislation passed through committee unanimously to the floor, where a public hearing has been scheduled. Not because a public hearing was the correct next step, but mainly because I think the council members didn’t understand the weight of a public hearing at this time given the way this legislation was framed or explained. This is all so complicated, so we appreciate you following along and connecting the dots. The city seems on a tear to want to pass this merger through whether or not preservation professionals have had the opportunity to participate. At the May 2018 Laws and Rules Committee meeting, Kingston’s Corporation Council Dan Gartenstein laid out a timeline, recommending that the council hold a public hearing followed by two readings before a vote August to meet the City of Kingston’s budget cycle in September. When merged, the commission would be overseen by the planning department who could carve out a budget line in next years budget for funds in order for additional preservation work, such as identifying new historic districts or saving historic homes. When challenged to make the public hearing later in the summer, he stated that there was litigation in the wings that made the merger timely. For the record, the HLPC is not concerned about a budget line at this time. The commission only wishes to make sure that their current ordinance is clear. According to the Department of State’s document VIEW “Adopting Local Laws in NYS” on page 14 under ‘Public Hearings’ in Step III, that the ‘law is presented to the municipal governing body and introduced by one of its members” and not the corporation council as has been done. What is Kingston’s corporation doing introducing new legislation and then, placing pressure on council members to do so with speed? In addition, rather than merging commissions, we encourage the council to pursue the concept of a ‘coordinated review’ (and seek out models) as well as to map out the current process for projects to contemplate whether or not a different sequence of steps could improve its efficiency. Kingston’s Common Council Laws and Rules Committee meets next on Wednesday, May 16th at 6:30 pm in Conference Room #1 (top floor) at Kingston City Hall located at 420 Broadway in Kingston. Committee meetings are the council’s monthly ‘business meetings’. Although the public is always invited to attend, public comment isn’t always available. If you’d like to be placed on the agenda, you can reach out to the council committee board chair in advance to make that request. Q: “I see the land bank as a marvelous opportunity for the community….I am familiar with programs from another state, where they have taken vacant structures, fixed them up, rented them out, taken half of the rent that the new tenants paid, used that as a down payment to bring a neighborhood back to life so it’s affordable to folks in a city like Kingston. 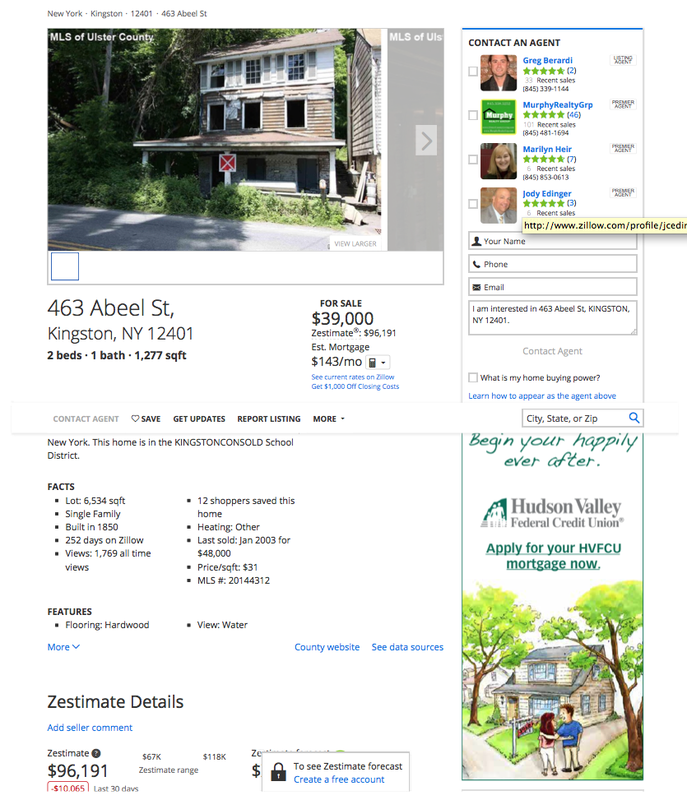 Is that one of the programs that the city of Kingston have in mind, and from folks on the state level, have you seen this elsewhere in NYS? Photo courtesy of Friends of Historic Kingston. 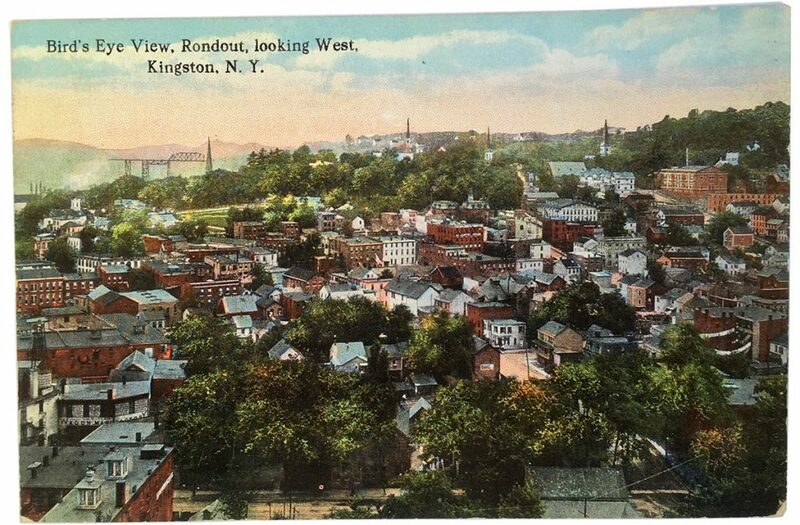 KingstonCitizens.org presents the public educational forum “Historic Preservation in the City of Kingston: Rethinking the Review Process” on Monday, May 14th from 6 – 8 pm at Kingston City Hall in partnership with the City of Kingston and Friends of Historic Kingston. Guest panelists will include the Mayor of Kingston and experts from the Kingston Historic Landmarks Preservation Commission, Heritage Area Commission, New York State Historic Preservation Office (SHPO) and Preservation League of New York. Kingston, NY. 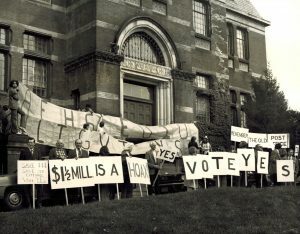 KingstonCitizens.org, in partnership with the City of Kingston and the Friends of Historic Kingston, will host the public educational forum “Historic Preservation in the City of Kingston: Rethinking the Review Process” on Monday, May 14th from 6 – 8 pm at Kingston City Hall, Council Chambers located at 420 Broadway in Kingston. Panelists will include City of Kingston Mayor Steve Noble; Marissa Marvelli, Vice Chair of the City of Kingston Historic Landmarks Preservation Commission; Hayes Clement, Chair and Kevin McEvoy, Secretary of the City of Kingston Heritage Area; Linda Mackey, SHPO CLG (Certifed Local Government) Representative for Ulster County of NYS SHPO; and Erin Tobin, Vice President for Policy and Preservation of the Preservation League of New York. 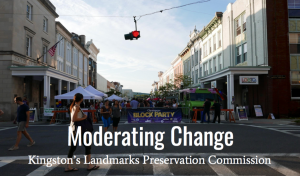 The group was assembled to share best practices for streamlining Kingston’s Historic Commissions in response to recent legislation introduced to the Kingston Common Council by the Mayor’s office. Streamlining Historic Commissions was a recommendation made by the consultant Shuster and Turner in their document “Comprehensive Amendments to the City of Kingston’s Zoning Law” hired by the City of Kingston in 2013 to lead its first Comprehensive Planning process since 1961. A public question and answer period will follow the panelist presentations. This event will be filmed by The Kingston News. About KingstonCitizens.org. Established in 2006, KingstonCitizens.org is a community-based group committed to improving the quality of life of Kingston residents through accountability and transparency of local government. By providing citizens with timely and factual information, our work is meant to nurture citizen participation and empowerment through projects, education, and advocacy. About the City of Kingston. Kingston, dating to the arrival of the Dutch in 1652, is a vibrant city with rich history and architecture, was the state’s first capital, and a thriving arts community. About Friends of Historic Kingston. The Friends of Historic Kingston are charged in preserving historical and architecturally significant buildings and sites in the City of Kingston; To promote and foster interest in the historical heritage and beauty of Kingston and, to acquire, preserve and exhibit materials relating to regional history and culture. 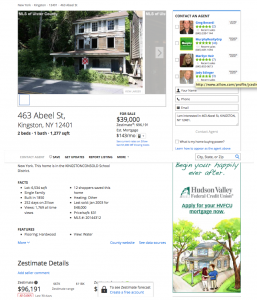 About the City of Kingston Historic Landmarks Preservation Commission. 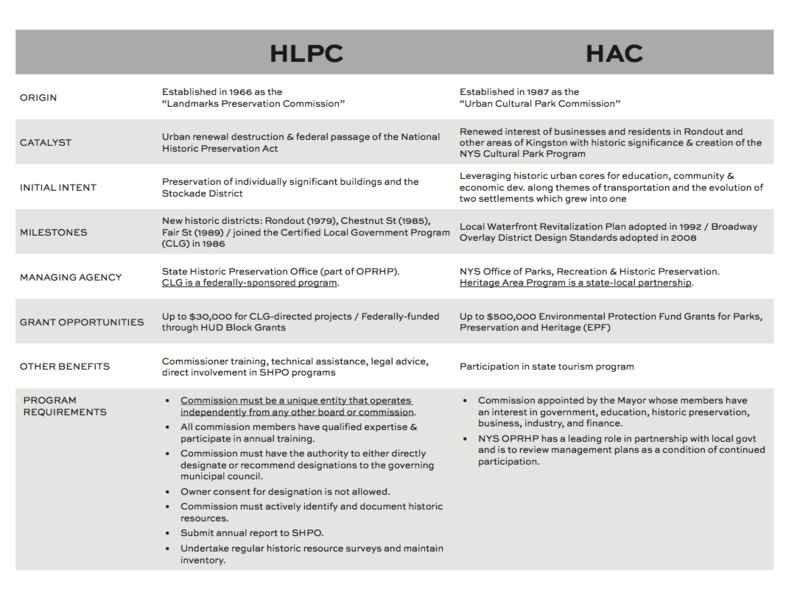 The Historic Landmarks Preservation Commission (HLPC) is a quasi-judicial body of Kingston citizens whose duties and procedures are outlined in Chapter 405, Article IX of the city’s administrative code. Its seven volunteer members are appointed by the mayor to administer the designation and preservation of Kingston’s individual landmarks and four historic districts. Current members have expertise in preservation planning, historic architecture, restoration arts, law, history, and real estate. The commission holds public hearings the first Thursday of each month where it reviews applications for work to historic properties and discusses matters related to public education about the protection and perpetuation of the city’s built heritage. About the City of Kingston’s Heritage Area Commission. The Heritage Area Commission is charged with the responsibility of advising the Mayor and the Common Council on all matters related to the Kingston Heritage Area and its programs in a manner consistent with the concepts, goals and objectives set forth in relevant state and local legislation regarding New York State Heritage Areas and in the Urban Cultural Park Management Plan. About the State Historic Preservation Office (SHPO). The SHPO works with governments, the public, and educational and not-for-profit organizations to raise historic preservation awareness, to instill in New Yorkers a sense of pride in the state’s unique history and to encourage heritage tourism and community revitalization. 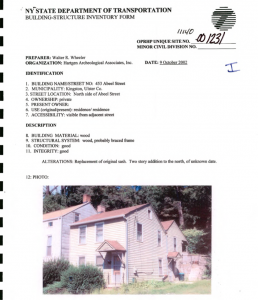 The SHPO administers programs authorized by both the National Historic Preservation Act of 1966 and the New York State Historic Preservation Act of 1980. 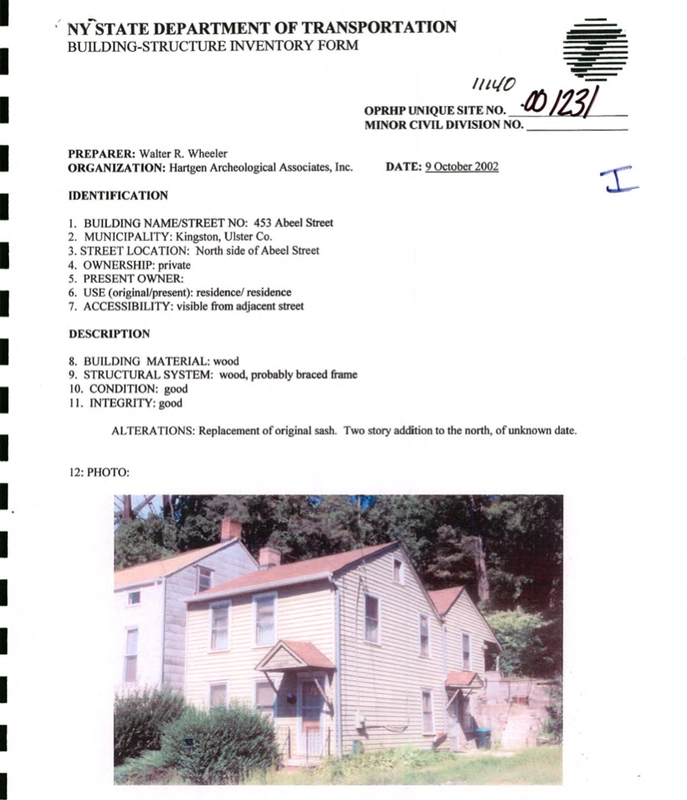 These programs, including the Statewide Historic Resources Survey, the New York State and National Registers of Historic Places, the federal historic rehabilitation tax credit, the Certified Local Government program, the state historic preservation grants program, state and federal environmental review, and a wide range of technical assistance, are provided through a network of teams assigned to territories across the state. About the Preservation League of New York. The Preservation League of New York State invests in people and projects that champion the essential role of preservation in community revitalization, sustainable economic growth and the protection of our historic buildings and landscapes. We lead advocacy, economic development and education programs across the state. Cherry Picking Comp Plan Zoning Recommendations: The Streamlining of the HLPC and HAC in Kingston. Please read to the end to review the call to action. In December of 2017, the consultant Shuster/Turner Planning & Zoning Consultants, hired to lead Kingston in its Comprehensive Planning (CP) process, completed its work by submitting its CP Zoning recommendations. Currently, the Mayor is determining some sort of new CP Zoning group, and a process in how citizens will be able to participate. That was a bold move, and we all appreciated his leadership on the matter then. City of Kingston Corporation Council Submits Legislation to Kingston Common Council, Applied to the Council Laws and Rules Committee. Legislation was submitted along with his communication and assigned to the Kingston Common Council Laws and Rules Committee that will meet on Wednesday, April 18th at 6:30 pm. This was curious to me as “Streamlining Historic Preservation, Cultural and Design Review 5264-1” is an item in the Comp Plan Zoning Recommendations document (Part III, Section C, #4). It is also one of the items that have been a point of contention for professional preservationists and others. Anyone following this process can’t help but wonder – why has the executive branch chosen a single item from the CP Zoning recommendations to present legislation to be reviewed by the Common Council before a new CP Zoning group is established? Corporation council serves at the pleasure of the Mayor, so this request seems out-of-step with the Mayor’s intent to establish a new CP zoning group, who I assume will be charged in looking at the document comprehensively before presenting recommendations to the council for discussion, debate and, passage. This presents a confusing conflict outwardly to the public. 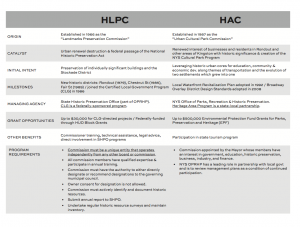 What does the Historic Landmarks Preservation Commission (HLPC) and the Heritage Area Commission (HAC) do in the City of Kingston? As a citizen, you’d be hard-pressed to understand what the HLPC and HAC do by visiting the City of Kingston’s website. To look at the “Boards and Commissions” tab, you’ll find that on either page, there isn’t any information about their work. Only mostly a list of those who serve. To find information about either commission, you’d have to know to look in the City of Kingston’s code. There are no instructions to the public to do so, making it nearly impossible for anyone except experienced city government watchers to know. Kingston’s Historic Landmarks Preservation Commission, as I understand it, is a regulatory body, charged in part by the State Historic Preservation Office (SHPO). You can review the meat and potatoes of their work by visiting HERE. Approaching CP Zoning Recommendations Comprehensively. Our comprehensive plan hasn’t been updated since 1961. 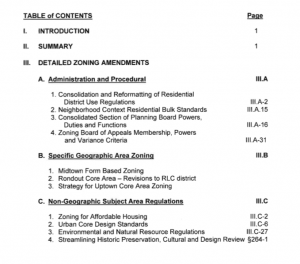 Zoning to match, for as long – although zoning amendments are a regular occurrence. Is cherrypicking an item from the new CP Zoning recommendations an emergency? If so, why? If not, a better course might be to allow a newly established group, which is imminent, to look at the CP Zoning recommendations comprehensively, and that includes streamlining commissions. On Wednesday, April 18th at 6:30pm in Conference Room #1 at Kingston City Hall (420 Broadway), the Kingston Common Council Laws and Rules Committee will meet. On their agenda, is legislation to ‘streamline the HLPC and HAC’. We have been told by council members who sit on the Laws and Rules committee that no decision on this legislation will be determined. However, the language has been introduced and is now in the pipeline. That is significant. That Corporation Council, who I presume will be present that evening, explain why legislation to streamline the HLPC and HAC has been pulled out of the CP Zoning Recommendations to start the review process before a new CP Zoning Committee or workgroup has been established. Request that the Kingston Common Council committee table the discussion for a time when the new CP Zoning committee/workgroup has completed its work. 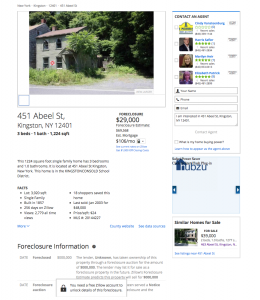 Kingston Alderman Questions Demolition of Potential Historic Properties in Kingston. Today, Ward 3 Alderman Brad Will issued a communication to the Common Council regarding his concern of the potential demolition of what are potentially significant historic properties in Kingston. The public is invited to attend the next Common Council meeting on Tuesday, May 5th to voice in on the following information. To view KingstonCitizens.org’s Facebook invite on the upcoming meeting, please visit our FACEBOOK page. Equally important will be the City developing comprehensive and public-accessible criteria to evaluate not only the structural integrity – but also the historic value and status – of any property that is being considered for demolition. This means the City has to do its homework with SHPO, DOT, the County, Heritage Area Commission, Friends of Historic Kingston, and any other entity that may offer valuable information regarding a given property’s status. “Here in Kingston we say, “Historic is just our beginning,” but when it comes to historic preservation, we aren’t just getting started. We know that when people are looking to move to a city like Kingston, back to a place where population has declined over the years as factories closed or the shift took place toward the suburbs, they look for historic areas first. TAKE THE SURVEY! 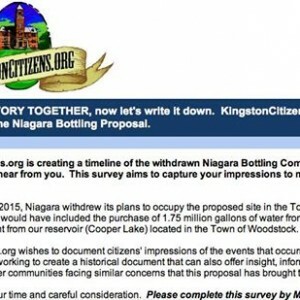 KingstonCitizens.org Creates Timeline of the Withdrawn Niagara Bottling Company Proposal. KingstonCitizens.org creates timeline of the withdrawn Niagara Bottling Company proposal. The group has created a survey to capture the impressions of their partners and citizens to make a historical document. Kingston, NY – KingstonCitizens.org is working on a timeline about the Niagara Bottling Project and wants to hear from the public. On February 13, 2015, Niagara withdrew its plans to occupy the proposed site in the Town of Ulster. The proposed project would have included the purchase of 1.75 million gallons of water from the Kingston Water Department from our reservoir (Cooper Lake) located in the Town of Woodstock. The group wishes to document citizens’ impressions of the events that occurred over the past six months. The group is working to create a historical document noting each critical event that can also offer insight, information and inspiration to other communities facing similar concerns that this proposal has brought to light. 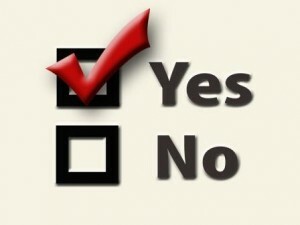 TAKE THE SURVEY or visit www.KingstonCitizens.org for more information. Survey responses are due Monday, March 2, 2015.